Do you want to know why your church visitor didn’t return? Don’t you wish that you could sometimes learn why a church visitor would choose not to come back after their first visit? There is one way you might learn: ask. But don’t start thinking you need to make a cold call and talk with a stranger who will likely be polite to your face. Rather, create a feedback loop where a visitor could share their negative (or positive) experience of your church. Assuming you get a visitor contact information, you’ll have the means to raise the question and give a simple action step via your church website. 1. Design one page as a landing page. Create a landing page on your church website. On this webpage, place both text and video by the lead pastor requesting feedback about their experience of your church. Ask if there was something they really liked, or something that needs improvement for future visitors. Talk about how you appreciate all suggestions that might help your church welcome visitors in the future. Invite them to tell you any problems they encountered so that you can address them. Leave a text box for answer. Give only one text box, and ask only one question. If you ask too much information, such s contact information, rate a number of stars, and other sorts of questions, you’ll create friction that will keep people from answering. Every time I fly in a plane, the airline check’s in with me afterwards via email to fill out a survey. While I never expect a reply (it’s anonymous), I volunteer my opinion to improve their service. Use can use a contact form plug-in, or maybe even Google docs for a form. Remove all other links on your landing page at your church website (you do have a church website, don’t you? ), so that the only action is to fill out a form and hit the submit button. Once they hit a submit button, send them to a page where they can download the MP3 or to some other part of your website that would invite them to return. 2. Ask your visitor to visit that landing page. Send your church visitors an email or text with a simple request to visit that a particular webpage on your church website. If you get an email address as part of your contact card, send a link to this webpage as the only action item in the email. If you only get mailing address information, then include the link in your first time visitor follow up letter. If you are in a culture that uses text messages, consider sending the invitation via text message if that is appropriate. Invite your guest to click on the link and visit a special page where they can share anything that needed fixing, that you might have overlooked, in making it easy to get to the seat. Or invite your guest to share what they really liked. Promise them that it’s a simple one question survey that is completely anonymous and give them the link to take action. It’s not the place to ask or evaluate the worship team, the sermon, the facilities, the staff, the volunteers. Ask them only the one question – you aren’t trying to find out everything. 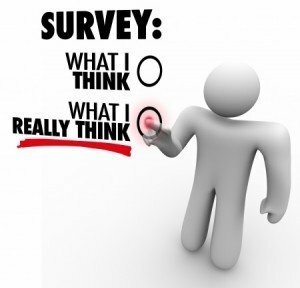 If you want to measure your marketing, change the one feedback question for several weeks. Use your question to only look at one issue – to keep it simple. Too many questions will keep people from answering at all. 4. Act on what you learn. You might discover that the church greeter didn’t make eye contact. You might learn that no one said hello. You might learn that your visitor felt stared down because of not dressing right. You might learn that the door hinge on the bathroom stall is broken. You might learn that your church choir needs a tune up. By giving your visitors the option to provide you anonymous feedback about their visit to your church, you might discover something that needs addressing. Don’t let your response get stuck in committee. Find a way to fix it quickly so that you can remove any unnecessary barriers to your visitors. You will not get 100% response, so don’t expect it. Churches that try this approach have all discovered they get very little feedback. You might get 1 out of 100, or maybe 1 out of 4. I have no idea. But when a visitor shares a complaint, or points out something that needs fixing, or encourages your team with positive experience of their welcome, you’ll want to receive it. Offering your visitors a chance to share their opinion about their visit will give you an insight into things you might need to fix. 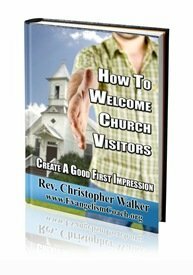 How to Welcome Church Visitors is a compilation of several hospitality articles all in one place formatted into one eBook. It is for church hospitality committees, leaders, and greeters that need to get a fresh vision for welcoming the visitor who comes to your church as well as practical steps to get started. If you are in a hurry and without enough time to read all the hospitality articles here, get your copy of How To Welcome Church Visitors. What does the Bible say about Hospitality Ministry?